An American classic, the boat shoe is a fashion staple around the world. It is a shoe that a man or woman can wear in hot climates and is an alternative to the flip fop, and yet it is still very functional in it’s intended use, which is walking sure-footedly around a wet and slippery boat deck, which might be polished wood, or textured fiberglass. The first boat shoes were made by Sperry. Since 1935 they have been called Sperry Topsider Authentic-Originals, and they are now made in the far east, with the exception of the pricey “Made in Maine” variant. Sailors call them by the initials of Authentic Originals, “A-O’s” They come in different types of leather, with different sole materials and are easy to find. Sperry have boutique stores in major shopping malls, and of course they sell via their website, and then the online sellers Amazon and Zappos carry them, often at below retail prices. Paul Sperry hand carved the rubber sole of his shoe with a penknife after realizing how slippery boat decks were after he slipped and fell in 1935. The process was called siping and was first developed in the 1920s by boater John Sipe. The US Navy issued various footwear styles to the enlisted and they had the trademark Sperry Topsider, from 1936 to the mid-Forties. The A-O has been available to sailors and everyone else since 1935. Topsiders became part of a dubious image, “The Preppy Look” or “The Ivy Look” during the 1950’s but today people from all walks of life find a way to incorporate a boat shoe into their style. A very similar shoe, in fact visually almost the same, is the Sebago Dockside. Docksides were at first a copy of Topsiders, not being available until 1970. But the proto-docksides date back to 1946. Like Sperrys, they are now made in the far east, but as of 2014, the side-by-side comparisons of the brands reveal that Sebago use a higher quality leather and seem to have more quality control and consistency than Sperry. There are other boat shoes from several manufacturers that look like Topsiders and Docksides, most notably Timberland’s variant. Originally these featured the same quality leathers and were another faithful copy of the original. but now they are an inferior shoe and they certainly do not last as long. No matter what the brand, one of the most important features of the boat shoe is that every part of the inside of the shoe is leather. No man-made material should touch the foot. Discount brands that make cheap sneakers disguised as boat shoes, that have anything other than fine leather inside, are practically useless. This is important because, in case you did not know, boat shoes are to be worn without socks. If you wear socks with boat shoes you break the unwritten law of the universe. Now some people, usually men, have stinky feet. Feet themselves do not actually smell, but bacteria does, and people who have astoundingly not yet as adults learned how to effectively wash bacteria from their feet, toes and nails have stinky feet. Placing your feet into socks or into shoes that have man-made material inside them will result in foot odor and shoe odor. But a person who knows how to properly wash their feet, wearing an all leather boat shoe without socks, will never experience foot odor or shoe odor under any circumstances. And even if bacteria manages to grow in a boat shoe, they are designed to be worn wet and so they can be washed inside. And so the boat shoe, worn without socks is an alternative to flip flops that can be worn sockless on the hottest of days, can be worn in rivers and in the surf and are a good alternative for the many people who suffer lower back problems as a result of walking in flip flops. One issue that many people have with boat shoes is sole discomfort. This is because boat shoes were never designed for standing and walking all day. They are for wearing in the confines of a small slippery deck of a boat. But there is a secret that advanced boat shoe aficionados know that make boat shoes very comfortable. This secret is the orthotic insole. Not just any insole, so don’t rush to grab your $40 Superfeet, or two cheap inserts made of foam rubber from the drug store. The insole you put into a boat shoe has to have a top footbed made of 100% leather, and it needs to be cattle leather, not deerskin, not pigskin and certainly not pleather. We will discuss the deerskin issue later. Leather insoles are not that easy to find, but search online for Pedag, Ecco etc., and you will find your ticket to comfort. I recommend the Pedag Viva orthotic which comes in two different arch heights and features a metatarsal pad, with second best going to the more flat Ecco fashion insole. These are leather, and so just like the boat shoe, they do not promote the development of foot odor. Any other material, including the surface of Superfeet, will not protect you like real leather does. Of course no matter how clean you keep your feet, shoes will get dirty, and shoes that you wear without socks get dirty both inside and out. Leather is skin, as is your face, and so it should come as no surprise that the insides and outsides of boat shoes can be washed, like your face. In fact the most effective cleaner I have found for this is Clearasil Daily Face Wash. There are similar face-safe detergents also. Do not use hot water that can strip essential oils from the leather, but cool or tepid water is good and you can dry your shoes on cedar shoe trees, or better yet, put them on and let your body dry them in about an hour. Cleaning your shoes this way removes all the bacteria, all or most of the stains and is absolutely harmless to leather. Sperry Topsiders and Sebago Docksides have their fans and detractors. It is a bit like Ford versus Chevy. Since production moved to outside the US for reasons of economics, quality control has become an issue, particularly for Sperry. Some Sperry buyers, myself included, received boat shoes with white soles that for some reason were deadly slippery on wet floors. This is of course the exact opposite of what anyone wants from a boat shoe, and we can only hope that all such inventory is long gone. Different colors of boat shoe are made from different leathers. With regard to Sperry, you will find that the smooth leathers in traditional brown, navy etc have a medium-quality full grain leather. It lasts a fairly long while, does nicely when washed, except the color bleeds a little bit. The stitching is almost always good enough, and the soles are normally okay. Unless you somehow get the aforementioned slippery whites, you will be alright. Some styles have a very soft leather with a semi-suede buckskin texture and these need almost no breaking in period. They are usually comfortable as soon as you take them out of the box and put them on. Sperrys with the brown (natural rubber) soles, as opposed to the white soles, have more impact absorption, because the white rubber is pretty hard. The smooth leathers from Sperry have a reasonable amount of good new leather smell too that somehow returns with each wash. But as mentioned before, Sebago quality is a bit higher. If you buy the “brown oiled waxy with smoke” Sebagos with the brown soles (B72743), you will see a leather that looks like “Horween Chromexcel” (but is not). It has a pull-up effect, turning light when you raise it with your thumb and then returning to dark as the leather contracts. The smell is like that of a new fine-leather wallet. The stitching is almost perfect except for the occasional sharp thread end which we will discuss under breaking-in. The sole padding is better than that of Sperrys. Like Sperry, Sebago also uses different types of leather for different colors and some are easier to break in than others, The ones with the best leather are also the hardest to break-in. If you buy brand-new brown Sebagos in the right size and put them on and go for a walk the pain might be terrible and you might get blisters. In the long run, Sebago comfort is astounding, but it takes some work. Whichever brand you get, and I recommend you try both over time, because you cannot judge them when they are new. You have to know two things, boat shoes benefit from insoles, and boat shoes need to be broken in. As we have discussed, your boat shoes might be unwearable pain-inflicting devices when you take them out of the box. But boat shoes are unlike any other shoe. Not only are they supposed to be worn without socks, but they are designed to be worn wet. Even underwater! So it comes as no surprise that breaking in your boat shoes involves getting them wet. Leather is a natural piece of hide, and while it may be treated, stained, dyed, tumbled and processed before it becomes a shoe, it is still made up of fibers. When the leather is wet, these fibers lose their lock on each other and the leather can stretch readily, and shrink too. So the process of wetting the boat shoe is the last stage of getting them to fit and the first stage of smoothing down any rough spots, sharp edges and sharp ends of thread. Before you start, take a warm shoe and knead it and flex it and massage the collar that goes around the ankle. Twist it from side to side, put your hand inside and feel around for hard leather to soften up. Loosen the 360 degree lacing. Then you are ready to get wet. If you live in a home that has a bathtub, fill it with a few inches of lukewarm water, no detergent of any kind, put on your new boat shoes and step in. Allow water to fill up inside the shoe around your foot and to slosh all over the outsides. Depending on your exact leather type and color, you may see no coloration in the water (for example with brown Sebagos) or a lot (for example with navy Sperrys). The leather will begin to saturate, either immediately or after some time, depending on the leather and then it will start to both shrink and stretch and conform to your foot as you step around the tub and flex your foot etc. Many people will tell you that the way to go is with brine, (salt water). They advise placing your new shoes in brine and soaking them. This is to remove the new look and impart the salty stains of old sailing shoes, and is not perhaps what the city-dwelling boat shoe aficionado is looking for. Exiting the tub, soak up most of the water with a towel, remembering that some colors are not color-fast and will stain the towel, and then proceed to dry the shoes. The best way to dry the shoes is to wear them at home after your soak, and keep them on until they are dry or almost dry. But a wooden shoe tree is second best. No need to use hot air unless your house is very cold inside. Besides the soak, you may have to manipulate the shoe and massage the hard spots, some more and re-adjust the 360 degree lacing . I also advise using your fingertips to search inside for any sharp thread-ends and either pluck these or snip them off to prevent a source of blistering from developing. Earlier in this article I mentioned the unwritten law of the universe, never wear socks with boat shoes. But if your new Sebagos are still putting pressure on some spot after the wet breaking in process, make sure no-one sees you and put some socks on and work the shoes some more with this added layer of skin protection. No two pairs will be the same but this wet soaking process will reduce your break-in period by many days. In fact you could be completely done in one hour. It is important to get the right size and the right width. A wide foot will never be comfortable in a regular width shoe, and going up a size is no way to get it right. If you can find a shoe store that has a Brannock Device, get your foot measured, either bare or in a thin dress sock, to find your ideal size and width. Again, a size 9.5 E foot should not be in a size 10 D shoe, for example. Online stores such as Amazon and Zappos often sell Sebagos and Sperrys for a lower price than the Sebago and Sperry websites or Sperry stores. I just got some new Sebagos for $60 on Amazon that are listed at $105 on Sebago. Similar deals abound, but remember that good boat shoes last for a very long time so do not get the wrong size or your third favorite color to save a few dollars. Sperry, Sebago and other makes also sell different types of shoes that are also called boat shoes. Some styles have soles like sneakers that promise comfort on a long walk or a stand-all-day situation. But not all of these shoes are designed for bare feet and oceans of water. Once you stray away from all leather insides, you enter some dubious territory, unless you plan on wearing socks and using them as sneakers, which is what many of them essentially are. You will also see new variations on the original boat shoe typified by the Sperry Gold Cup range. These cost about $150 and have golden eyelets, but they took a wrong turn with the introduction of the deerskin covered memory foam insole. Firstly, deerskin on a bare sole becomes as sticky as Scotch Tape as soon as your foot gets warm and damp. It will drive you crazy and also feel red hot. Secondly, a foam insole should compress and rebound. Latex will do that, but memory foam will not. It is too slow and the opposite of what you want in an insole. Of course you could remove these and pop in your own Pedags, but you will then have paid an extra $50 to $90 for ugly golden eyelets. Some variations of the boat shoe have a third eyelet and cover the instep all the way to the top of the foot near the shin. These do not have the classic cool look of a boat shoe by any means. You need to see some instep exposed for the traditional style. A boat shoe should not be a city blucher. If you want your shoes to be wearable from the second you put them on in the store, look into Sperry Topsiders in the less-smooth tan-colored finish, with the brown sole. These are made of the soft, almost Nubuck type leather and the brown sole has a bit more spring than the white. Sperry changes their colors and leathers from time to time so you need to see them in person. If you want to work for an hour or so or even a day or so to get the best, that will last the longest, and feel like part of you, consider the Sebago in brown oiled waxy leather, get the Pedag leather insole and do the bathtub thing. The Sebago Docksides last for a very long time so it is worth investing some time into breaking them in. Jeffrey the Barak needs to wear flip flops but cannot stand walking in them and they make his back hurt, especially when he is carrying an old French submarine and two goats. It has been years since he was anywhere near actual boats, but boat shoes get the job done anyway, as long as it is not snowing. 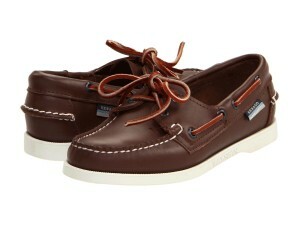 I love sebago shoes; I have the black but also need this brown one. How can I order for one in Lagos, Nigeria? I’m trying to decide between the brown, brown elk and brown oiled waxy. I want durability and suppleness; at some point. 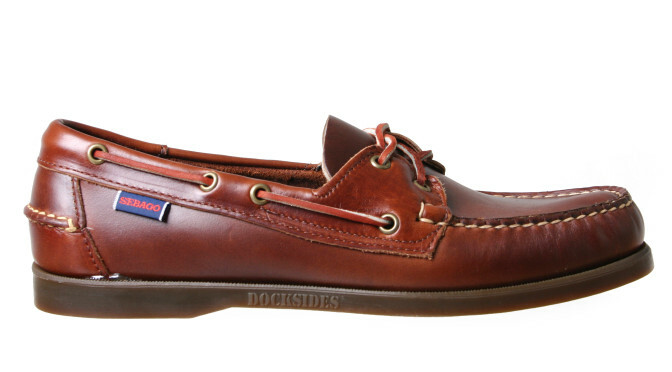 I was told by a rep at Sebago that all three colors use the same leather, but the brown oiled waxy looks softer to me. What are your thoughts on this and whether or not the oiled waxy would break in better/faster than the elk and the brown. I would guess the oiled waxy would be the slowest to break in. Recently decided to embrace the “boat shoe” lifestyle….. got two pairs of top siders, started listening to Jack Johnson, Donavon Frankenreiter !!! My all leather navy blue sperry top-siders are KILLING my feet……. I’ve dunked them in water before wearing them with bare feet, worn them another time with sperry no show socks…… back left heal still gets eaten up (worn out 3 times now) ……… I’m NOT giving up…….. right foot feels FANTASTIC……. the reddish brown gold A-0’s don’t hurt nearly as much but aren’t great YET! Looking forward to experiencing them for what I know they are! Look for sharp nylon threads sticking out at the blister point. If found, file them away. Filed them ALL away…. and now have a perfect fit……. like wearing slippers!!!!! You should be able to wash those “Nubucks” without issues, regardless of whether they are reverse-leather or made of disguised polyester. Sirs, I´ve been swimming in clear mediterranean waters with my ten years old Sebago Endeavor on. After years of dubbing and other greases, the shoes kept relaxed, the leather seems to say: Thanks man, the best thing you ever done for me! I was inspired to pull out my old red, white and blue Sperry Topsiders after seeing the US Olympic team wearing them during the opening ceremony. I quickly learned why I had stopped wearing them: They have the dreaded slippery white sole! Is there anything I can do to make them safe at least for street wear? I’ve read that even sandpapering doesn’t always work. I have a pair of Sebago Marine grip shoes that the soles have turned so hard that I cannot wear for fear of slipping and falling. The soles started to turn hard when quite new. Sir I have a question, I was wearing my classic black leather sebago shoes (the one w/o laces on top) I accidentally walk in a flooded area submerging my shoes about half of it’s height. Does that condition shorten the lifespan of my shoes? Will it break easily? breathable mesh insert on the side . Write to Sperry. They may offer to take them back and inspect your findings, and you could get new ones or store credit. I love my Sperry Topsiders. The best are the smooth tan leather ones. Buttery soft after a bit of wearing in. I’ve also got some Sebago Spinnaker Docksides in navy, red and white and the leather is so much thicker and stiffer and took a lot more breaking in, but feel like they’ll last forever. For instant delight then Timberlands in Nubuck are a good bet.